Please excuse me or breaking away from my normal format the following fictional story is one of my favorites in a way it is my own story. It is a story not only about how cruel life can be but also the far reaching touch of God and the individual resulting inner strength gained from the touch of God. Perhaps as you read this story you’ll discover it is your story as well. Please join me in the great north woods on the first day of hunting season. “Please slow down, Mother. I can’t keep up with you,” Puffer called out to his mother. “There is danger in the forest, Puffer. You must keep with me, otherwise you will be lost forever,” Puffer’s mother quickly replied. Had this happened a week ago Puffer’s mother would have placed him under some leaves and he would have been safe, but now that he is getting older his coat of camouflage is gone and the young deer would no longer blend in. “But, I’m getting tired mother and slowing down,” Puffer called out again. Winnowie, Puffer’s mother stopped to listen, but was keenly aware the danger was getting closer. Instantly, her instinct to protect her young took over and she knew what to do. Turning and running in the direction of the approaching danger, she knew she’d have to expose herself and lead the danger away from her vulnerable young son. “Lay down, Puffer, and be quiet until the danger passes,” she whispered before bounding away. Seconds later Winnowie ran as fast as she could in front of the dangerous human hunter. Bam! Bam! Bam! Three shots rang out and one of the bullets pierced the soft flesh of the young mother’s shoulder missing her heart by inches, but knocking her to the ground. Puffer heard the shots and instantly sensed his mother was in far more danger than he was, yet his training to stay hidden was strong, so he didn’t move. As Winnowie lay on the ground, still not sure of what had happened, she heard the distant sounds of footsteps approaching so with all the strength she could muster she fought her way to a standing position and began moving away from the human. Bam! Bam! Bam! Three more shots rang out, but all of them miraculously missed. She knew safety lie deeper in the dense forest where the human would be unable to find her. Forty minutes later, exhausted and unable to go any further, Winnowie spotted a huge fallen tree, limped over to it, and collapsed. With her remaining strength, she pulled herself under it and silently waited for the human to find her. A few seconds later, aware that her life was draining slowly, away she looked into the sky and asked the Creator if he’d see that Puffer was safe. “Are you okay, Puffer?” she called out one last time, then the young mother deer fell fast asleep and began dreaming. In her dream, she found herself standing in a desert surrounded by mountains of sand and cactuses. In the distance, she could see tall mountains covered with trees. Looking around she instantly knew she was in danger and knew safety awaited her in the mountains. So, as she dreamed, she began slowly walking toward the distant mountains. Meanwhile, as the night sky descended on the forest, Puffer sniffed the air for any signs of danger. Detecting none, he slowly stood on his feet, sniffed the air once more in an attempt to locate his mother, and began moving in the direction he last saw her. “Mother?” he called. “She ran in that direction,” Nightrude, the owl, said. The old owl awakened by the gunfire had seen everything. Nightrude didn’t want to tell Puffer he thought his mother had been killed, so he simply told him that his mother was okay the last time he saw her. Using his wing to point, “Walk in that direction, Puffer, and you’ll find her I’m sure,” Nightrude replied. “Thank you, Nightrude,” Puffer said, as he turned in the direction the owl had pointed. In the back of his mind, he knew something terrible had happened to her because she always returned to where he was. Still dreaming, it seemed as though she’d been walking for hours and the mountains still seemed so far away. The higher and hotter the sun became, the weaker and weaker Winnowie grew. “I must have a drink of water,” she said aloud, as if she were talking to someone. Suddenly ahead, she noticed a human coming toward her. Instantly sensing danger, she immediately turned and headed back the way she came. Deep inside Puffer began sensing he’d never see his mother again. Stopping in a small clearing, he looked into the night sky and began crying. “What’s the matter, Puffer?” a strange voice broke the silence. Puffer, thinking he was alone, suddenly became frightened. 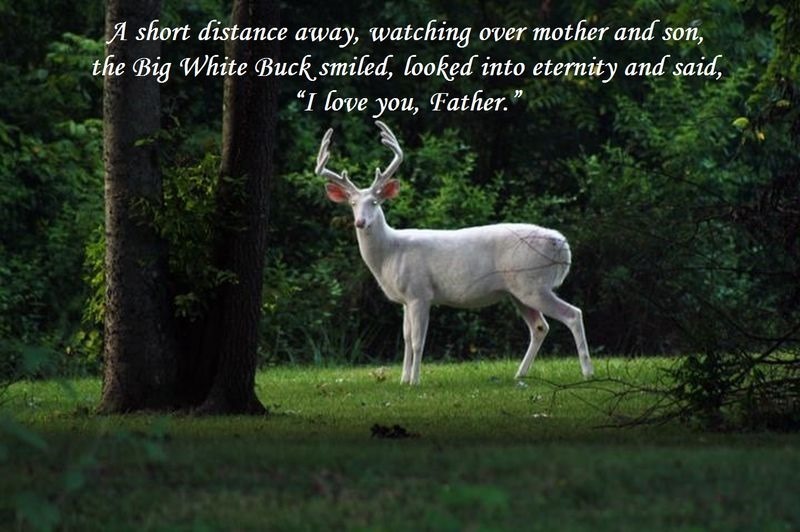 Quickly turning in the direction of the voice, he came face to face with the biggest, whitest buck he’d ever seen. “Who…whhoo…whhooo, are you?” he finally managed to say. “The Creator has sent me, so do not be afraid, Puffer,” the white deer replied. “The Creator is the one who made the forests and created you and your mother. “Did the Creator hurt my mother and cause me to become lost?” Puffer asked. “I don’t understand,” Puffer replied, trying to hold back his tears. “The Creator loves everyone so much that he lets everyone choose their own actions,” the White Buck answered. “Even if they hurt someone else?” Puffer asked. “But you are not dead. You are talking to me,” Puffer replied. “If you believe that, Puffer, your mother will live,” was the reply. “I will not doubt you. Will you help me find her?” Puffer asked. Looking into Puffer’s big eyes the buck said, “I have finished what I came to do. You must find her yourself. Rely on your love for her. It will not let you down.” Suddenly the White Buck disappeared, leaving Puffer alone in the now dark forest. When the man got within three or four steps of her, she closed her eyes and waited for a loud noise that would mean the end of her life. “I’ll miss you, Puffer,” she whispered. Winnowie felt something warm touch the top of her head, “Are you thirsty, Winnowie?” A strange voice asked. Puzzled, because she could understand him, she hesitated for several seconds. Finally, “Who are you?” she asked. “You’ve seen Puffer? Is he okay? Did the hunter ever find him?” she asked. Before the man had a chance to say anything else, “Is the Creator the one who made Puffer so he could not run fast?” Winnowie asked. “I don’t understand,” Winnowie replied trying to hold back her tears. “The Creator loves Puffer, so whatever he lacks in speed he will make up for it in strength,” the man answered. “I still don’t understand,” Winnowie replied. “But you are not dead. You are talking to me,” Winnowie replied. “If you believe that Winnowie, you will live,” came the reply. “I will not doubt you,” the injured doe answered. The man touched Winnowie on the mouth and instantly she was no longer thirsty and along with the life giving water, she felt strength slowly returning. “Over here! Over here, Puffer. I am over here,” she answered back. Hearing the grass parting, she turned and expected to see Puffer, but instead she came face to face with a hungry wolf. “It’s a wolf! Run away, Puffer, as fast as you can,” she instinctively called out. He stopped and shouted, “I love you, Mother,” and began running as fast as he could toward the place he thought her voice had come from. The wolf sensing Winnowie was injured and unable to defend herself, readied himself to leap on her for the kill. Crouching down, his massive muscles flexed, sending him flying toward Puffer’s mother. Winnowie could feel her strength increasing, but was still unable to move. She called out to Puffer one last time, “Run, Puffer, run!” She then closed her eyes and waited. Almost as soon as the wolf left the ground, something leaped from the bushes and struck him in the head, knocking him to the ground. Shaking his head, he opened his eyes and stared at Puffer. But Puffer, with the strength of the White Buck, leaped again, not giving the wolf chance to stand up. The wolf rolled again. A third time Puffer attacked; again the wolf rolled over. “Be gone, Wolf,” Puffer yelled. When Winnowie heard Puffer’s voice, she opened her eyes and was shocked to see her son staring down at a wolf three times his size. The wolf groggily stood up and moved toward Puffer. Puffer leaped and both front feet landed between the wolf’s eyes. The wolf fell unconscious to the ground. “Are you okay, Puffer?” she asked. “I’m okay, mother,” he replied, staring at the wolf. Several minutes later, the wolf began waking up. Puffer stood his ground. “Be gone, Wolf,” he said a second time. As the wolf wiggled around trying to stand up, Puffer crouched down ready to leap again. The wolf slowly stood up, wobbled, then turned and walked away, leaving Puffer and his mother to themselves. For nearly an hour mother and son rehearsed to each other the miraculous events since the hunter first appeared in the forest. Finally, “Mother,” Puffer said. “I love you, too, Puffer. I wish all the humans were like the Creator’s Son,” Winnowie answered. “Good night, Puffer,” she replied. “Good night, Mother,” Puffer, answered.